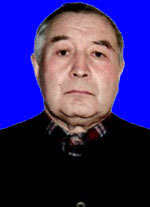 Almenov Kussain Seitbaevich – candidate of technical Sciences, associate Professor of the department of BMaT. specialty “Industrial and civil construction”. Qualification: civil Engineer; candidate of technical Sciences, specialty “Building structures”. In 1971-senior engineer of research sector of Carpti. From 1972 to 1974-master, foreman, senior foreman in the construction and installation trust “Kazmetallurgstroy”. From 1974 to 2005-senior researcher, assistant, senior lecturer, associate Professor of the order of the red banner of Labor of the Polytechnic Institute, and then in the Karaganda state technical University. 2005-2008: master in LLP “Casantica” on the construction of the RSE “Casartelli”. 2009 — present associate Professor of the Department “Construction materials and technologies” of the University. Additional information: own programs MicrosoftOfficeWord, AutoCAD, Lira 9.6. Lectures on disciplines “Building structures”, “Engineering structures”, “Calculation and design of strengthening of building structures”, “Calculation and design of multifunctional high-rise buildings”, “Calculation and design of spatial coverings”, “Construction physics”, “Bases of calculation of building structures”. Author of 42 scientific and educational works.